The night hike craze continues with a hike up the popular Moanalua Middle Ridge to the backside of Haiku Stairs (Stairway to Heaven). The last time I was on the Haiku Stairs was back in April 2011 when I did the Moanalua Saddle to the Stairway. Kevin and I actually planned this hike while we were hiking Koko Crater North Rim at night the week before as part of our desire to try something new (like hiking at night). It was the night before the actual full moon but with the Ko'olaus clear of clouds for much of the day, we decided to give it a shot that night in hopes of viewing Kaneohe from the CCL building atop the Haiku Stairs terminus. Unfortunately, the gusty tradewinds that were ever so present had other plans in store for us. I met up with Rhonda at Walgreen's Kaneohe at around 6pm to stage her car on the Haiku side as we were going to go up Middle Ridge and come down the Stairway to Heaven to finish the hike. 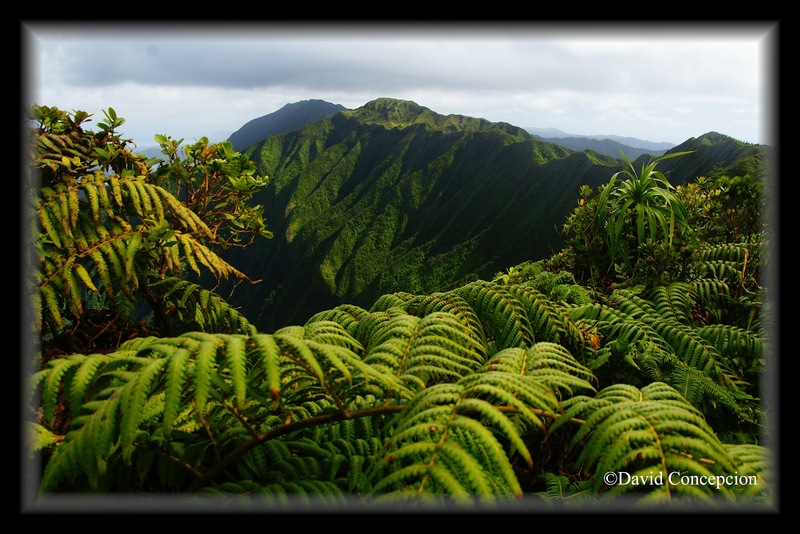 The view of the windward side of the Ko'olaus looked promising as clouds remained high above the summit ridge. Even the moon rise was clearly visible, shining brightly under a twilight sky. After parking my car at Moanalua Valley park, we were greeted by Shaun, Ryan, Thessa, and Robin. Kevin and Jeremy were running late and were to follow us in. 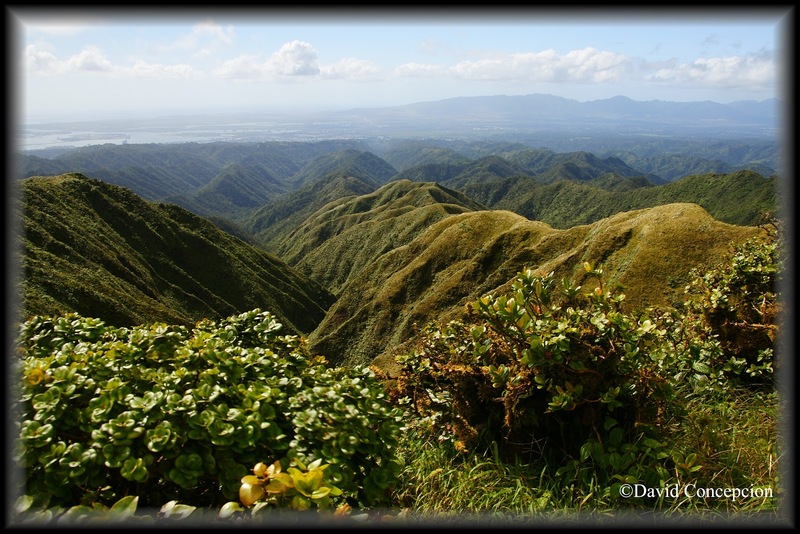 Dave Fahrenwald opted to climb the Haiku Stairs and rendezvous with us at the CCL building. We set off at a little before 7pm on the long and rather dull walk on the 3 mile or so valley road that winds it's way through the floor of Moanalua Valley. With headlamps shining brightly, our lights pierced the darkness with ease and made for easy navigation. About an hour in, we reached the junction with the Kulana`ahane Trail and the Moanalua Middle Ridge a few yards beyond. It was then when Kevin caught up to us and we took a short break before pushing upward on the middle ridge. Up, up, up we went and the trees opened up to a more windswept ridge. Boy, were the winds sweeping the ridge indeed. Wind gusts even as high as 30mph roared over us and we had to navigate the somewhat narrow ridge to prevent us being blown off and down into the pitch black depths below. I put on my rain coat as knife piercing rain showers did not help. 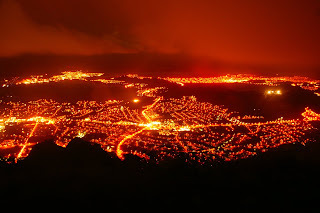 As we got higher up, we caught our first glimpse of the city lights of Moanalua and the Red Hill area. Up ahead we could make out the dark peak of Pu'u Keahi a Kahoe. 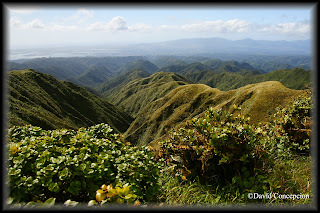 Slightly to the left, we could make out the silhouette of Moanalua Saddle and further left, the ridgeline of Red Hill Ridge. The hike became muddier as we progressed. By this time, my new Merrell's I've purchased from Soul Trex Windward Mall have been officially covered in Ko'olau mud! I spotted a headlamp way off in the distance and I immediately knew it was Jeremy after he messaged me about 30 minutes to an hour ago saying he was starting. Closer and closer did that light get the further we climbed upridge. All he needed was a train horn! After a few rope climbs here and a few muddy scrambles up various false peaks there, we came upon the steepest portion of the hike with ropes in place to aid in the climb. Beyond that, we dropped down slightly and back up to reach the summit of Keahi a Kahoe. Just a couple hundred feet prior to topping out, Jeremy's bright beam from his headlamp shined it's rays behind a bush just a few feet from us and finally he popped into view and greeted us. We reached the summit in the clouds and hung left along the summit ridge to begin our walk towards Haiku Stairs. Walk is an understatement. It was more buttsliding and "surfing" a muddy river than anything else before the CCL building came into view out of the darkness. At around that time, the city lights of Kaneohe appeared. The clouds were lifting just in time for us to make the summit of Haiku Stairs. However, the wind was strong. Very very strong. We all huddled in the CCL building and I finally got the opportunity to meet Dave in person. He probably made it to the top about an hour before we rendezvous with him. With the winds howling, it was very difficult to set up the tripod for my camera and simply had to rely on holding my camera firm against the concrete roof of the CCL building while battling to fight the wind chill. Yes, wind chill! I could see the 2 "radar" dishes, which were anchored to the roof, rocking violently in the heavy winds. One of these days, the rusty support structure holding them in place will fail and the dishes will be sent flying high and far leeward. Maybe they will land in my backyard in Ewa Beach as a nice souvenir! The views over windward were beautiful with the city lights. I could even make out the dark peaks of Olomana and even Makapu'u as the ocean was lit up a bluish tint under the full moon. However, the moon itself never showed. With this in mind, along the unbearable winds, we packed our gear and commenced the long and grinding walk down the Haiku Stairs. The stairs and railings were wet and cold, requiring caution to avoid slipping. We reached the winch house and the moon revealed itself at last, shining everything in view. I snapped some photos but my lens is simply not enough to capture the beauty of the moon light. Oh well, maybe another reason for me to do this hike again at night. Shaun and I stayed back behind the main group and talked stories with one another as we carefully made our way down the 3,922 steps of Stairway to Heaven. About halfway down, someone pointed a green laser pointer at us (they did this on Koko Crater North Rim too!). 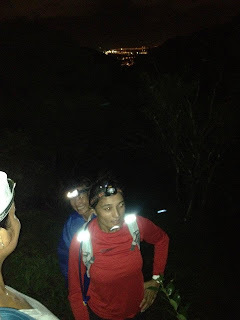 Apparently our headlamps gave out our position once again. The beam originated somewhere near Windward Mall. Do people have anything better to do? Actually this served as a reminder that it was time to turn off our headlamps because we were in a hush hush area. We reached the bottom at around 1am and proceeded to the nearest McDonald's for a well deserved treat. Will I do this hike again at night? Definitely! 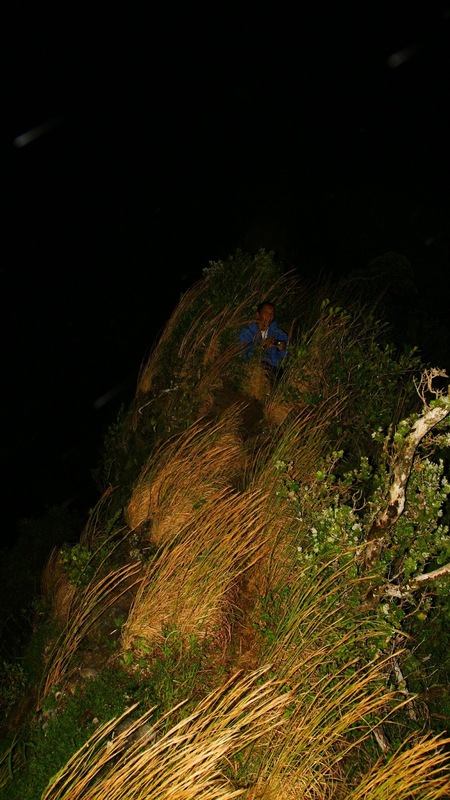 However, I do not recommend this if you are not prepared for a night hike or ridge walking. 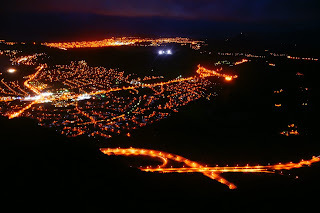 A good "practice" spot for night hiking is Mariner's Ridge and even the Koko Crater stairs (not the rim). While many people dislike hiking at night, I find it appealing! May the "Night Hikers" march on! Kevin called me up the night before and asked if I wanted to do a short hike. Since my last hike was the very very long Waimano to Aiea Ridge hike last month, I thought, "Why not?" 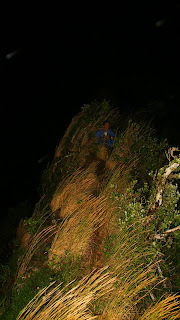 and since I've done the Koko Crater Rim a while back, I decided to add a twist: hiking it at night. Kevin agreed and I scrambled to get a crew together. In the end, it was Neel, Francis, Thessa, and Tarnia. We decided to start on the Hawai`i Kai Dr. side of the crater since the botanical garden was closed and probably guarded by security. As I drove through the urban sprawl of Honolulu, torrential rains fell over the H-1, but I was not discouraged. The weather was utterly wet around the main Ko'olaus, but the Hawaii Kai area was completely dry as usual in that area. After parking our cars in the near by neighborhood area at around 8pm, we crossed Hawai`i Kai Dr. and dropped into a cement ditch to pick up the slope of the crater on the other side. Francis took the lead and up we went through a dry and dusty forest to gain the crest of the north rim. From there, I took the lead and pierced the darkness with my headlamp. As we progressed further up, the ridge line narrowed, sometimes very thin, but contouring is possible to bypass most of the very sketchy sections. It was a pretty eerie feeling to be standing on a narrow dike with 2 drops into the black depths below. Like hiking in the clouds, there's that feeling of uncertainty to what's truly around you. We took several breaks along the way and enjoyed the beautiful landscape as the lights of Hawaii Kai lit up the ground like white Christmas lights (the holidays are coming!). I took out my tripod and took some night exposures of the lit up city scape. 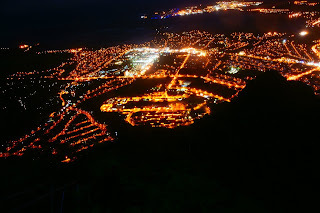 Kevin pointed out a lit up subdivision looking towards Makapu'u that looked like a sailboat when the city lights are on. Somewhere about halfway up, we were unexpectedly greeted with a very bright green laser beam, originating somewhere from the subdivisions across Hawaii Kai Dr. Francis pointed out that there's a skate park in that area and was probably some kids with nothing better to do then to point laser beams at hikers at night. I then remembered incidents where people flashed green laser pointers at airplanes coming in for a landing. That is just utterly stupid and dangerous for them to do that. Soon, it began to get very irritating so I had the crew hold position and turn off our headlamps for a while. It appeared to work and the green beam was gone. A little further up, a regular flash light was directed at us from another section of the neighborhood and appeared to be flashing morse code at us, perhaps asking if we were in distress. Unfortunately we did not know morse code and simply ignored it. Later on, a BIG white spot light was aimed at us from yet another area of the neighborhood. At first I thought it was maybe an HPD officer but that thankfully was not the case. Finally, if any of those other lights were not enough, a blinding blue laser pointer beam was directed from us from a 4th location in the same general area, much more powerful than the already powerful green laser pointer. Hawaii Kai apparently loves their lights and laser pointers. Soon we began contouring on the left side of the crest and lost sight of the laser beam. At about the 3/4th point, we scrambled up some rock faces, made our way carefully through cactus groves, and walked over a final set of narrow dikes before coming upon the final rock face just before the summit. It looks bad from below but up close, it's a cakewalk with plenty of hand and foot holds. We soon acquired the summit and reached the metal platform. 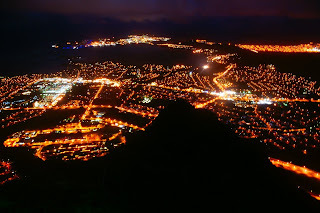 The views of Hawaii Kai all the way as far as Diamond Head and Waikiki were wonderful at night. Since it was getting late, we opted out of doing the Halona Blowhole side of the rim. After resting here for some time and taking photos, we went to the top of the tram tracks/stairs/"Stairway to Hell". Kevin pointed out a long tunnel just beyond the top of the stairs that leads into a huge bunker with several rooms. I've never knew about the tunnel so we decided to take a look before we headed down the stairs. Neel decided to skip the tunnel part and proceeded down the stairs first while the rest of us followed. The time was a little after midnight when we reached the Koko Head Marina to retrieve the car and ferry us back to the neighborhood to get our cars. If you are curious about what hiking is like at night, give the Koko Crater Stairs a try. I probably wouldn't recommend traversing the rim itself at night, but the stairs leading to the summit makes for a great spot on a full moon night! of a video I took last year when we did the Koko Crater Rim during the day.